This is the fourth video of MIke Hughes interviewing Tony Blauer. Tony suggests training fine motor skills at elevated heart rate so they are available for us when our heart rate is elevated. One drill Tony does is hit the treadmill hard and jump off and engage in a combative drill with a partner. We can have a ton of training opportunities throughout the day. Even at obscure times during the day we can work on visualizing threats and also work on accessing weapons at various weird body orientations. Blauer, note Einstein’s quote “Imagination is more important than knowledge. For knowledge is limited to all we now know and understand, while imagination embraces the entire world, and all there ever will be to know and understand.” Being creative in your training can be more important than simply knowledge about a subject. Blauer notes how you can use your environment to provide stimulus for a training opportunity. (3:40) With regard to flinch training, there are three things to remember, a threat very near will produce immediate head protection, as the distance changes but the protective mechanism will have the hands slightly more extended, thirdly our hands will intercept the threat-line, the trajectory from the threat to the head. If a dog comes at us the threat line may be lower and our hands will be lower. The SPEAR is simple is ambidextrous right out of the gate. So our “skills”, our complex motor movements, have to be trained in high volume, but be sure to train them in awkward positions. Blauer cautions that in a role playing course, don’t stage the scenario, but rather flash the movement and produce the flinch synthetically to get adrenaline dump, change heart rate change, and other physiological changes. In this manner we are not putting one another in danger to make the training sustainable. In a friendly environment we can induce the adrenaline dump and the physiological changes… then we can train skills from that start point. During the day a high volume of slow motion drill work can add value but be sure to give the three stimuli of auditory, visual and tactile to start the 1000 mile journey of figuring out what works and what doesn’t work. Where do you want to take your training? 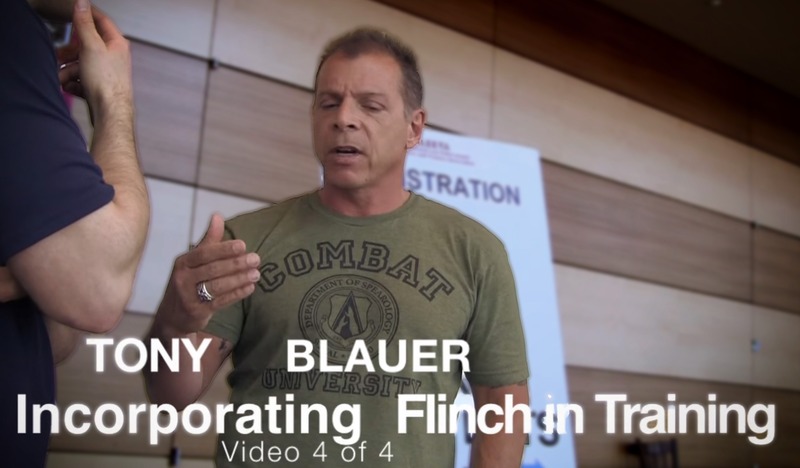 More material from Tony Blauer. Drills related to the flinch and open hand to pistol training. Linking open hand to use of a pistol training.